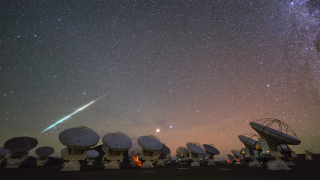 Imagine pressing a button on your smartphone to conjure up a meteor shower. That's the vision of a Japanese entrepreneur preparing to launch a satellite that would make it possible to release man-made-meteors. "It is artificial but I want to make really beautiful ones that can impress viewers," Lena Okajima, who has a PhD in Astronomy, told AFP in an interview. "I'm thinking of streams of meteors that are rare in nature." She's collaborating with scientists and engineers at Japanese universities to build a 50cm-wide microsatellite that could eject dozens of custom-made balls at once from orbit. Once released, the balls would plunge back to Earth at a speed of up to 80 kilometres per hour. The chemical formula of the balls is a secret, but by adding different chemicals it would be possible to change the colour of the streaks they leave in the sky. They'd burn up in the process, meaning that nothing would reach the ground. What's more, the displays could allow scientists to gather information about the atmosphere at the same time. The altitude at which the artificial meteors would burn up is too high for balloons but too low for spacecraft, making it difficult to study. Analysing the light trails could provide important information about the state of our skies. "Making the sky a screen is this project's biggest attraction as entertainment. It's a space display," said Okajima. "We believe there are people who would be ready to put up money for supporting 'a world first' event that is also meaningful scientifically.